I'm starting another little shabby chic house. This one will be for Susan. 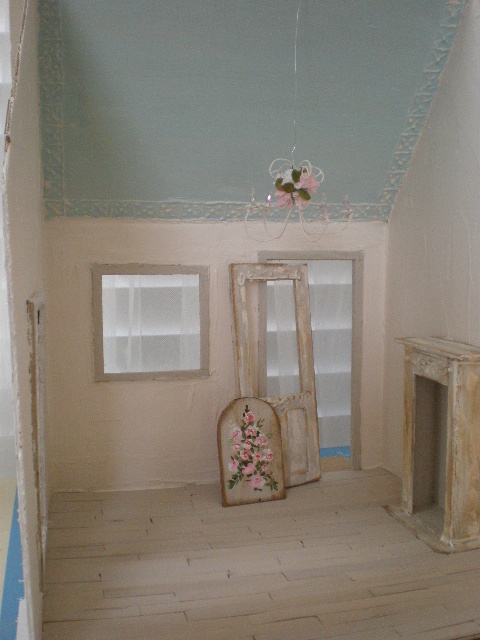 I've put the walls and 1 piece of roof up. 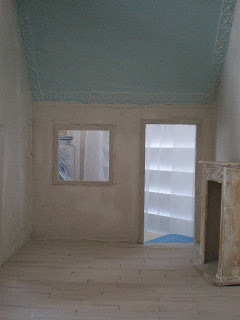 I have plastered the walls. 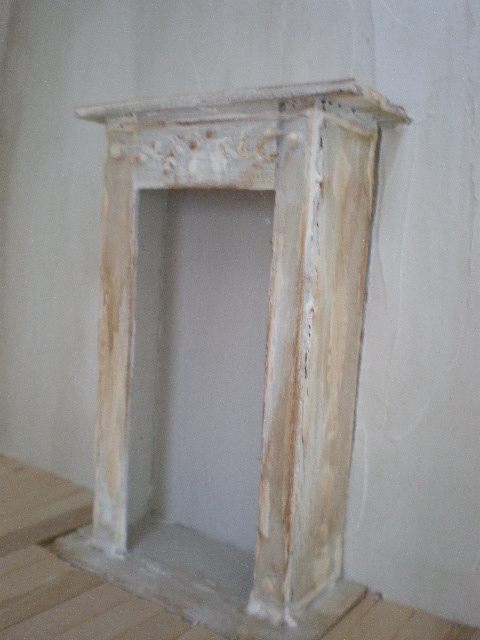 They still need paint. I also did the wood floors. 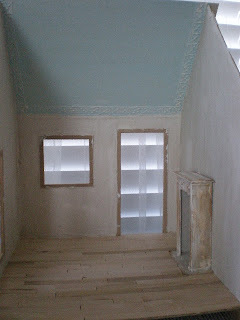 Here they are with a white wash. 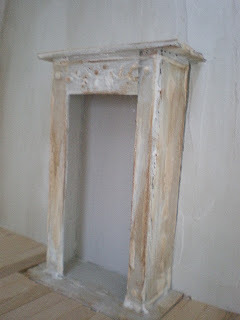 The fireplace is totally shabby chic. 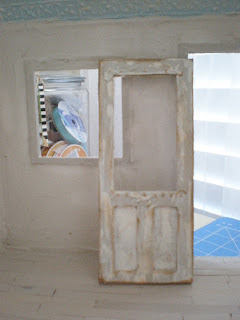 The door has a matching finish. 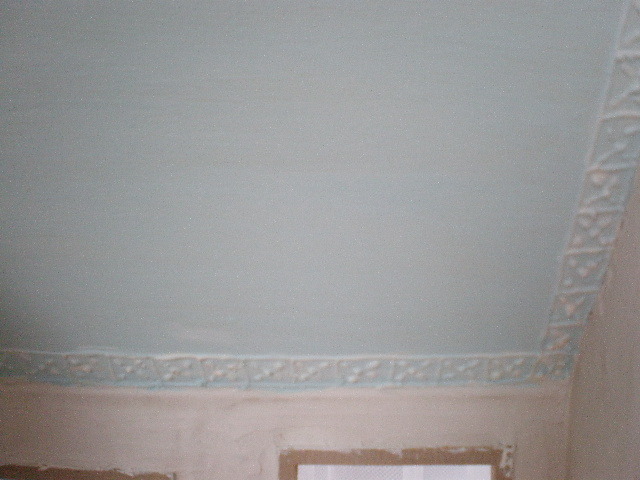 The ceiling is light blue with a beautiful 3D trim. This is what the outside looks like right now. 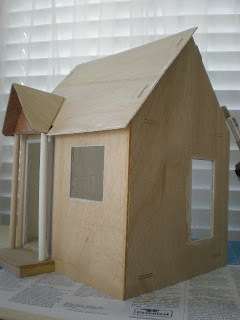 I'm making a little front porch. I've put two coats of cream paint on the plaster. And the painting is ready to put above the fireplace. This will be the chandelier. White painted wire arms, pink and white roses and a soon to be crystal chain will make a perfect little piece. Now I just have to wait for the interior to dry. Your ability makes the transformation of bits and pieces to a thing of beauty look effortless...isn't that the definition of true talent? The house reflects your love...thank you! I'm very excited! ¿De dónde sacas tiempo? Es asombroso cómo haces las cosas :-) Y además cada vez son más bonitas y lo haces más rápido. Susan va a estar encantada cuando la tenga, es una preciosidad. Ya estoy deseando ver los avances. Un beso y felicidades porque es muy bonita. te felicito!!! se ve un muy buen comienzo!, seguramente va a quedar genial!!! What a adorable little house,it looks great with the pale soft colors. 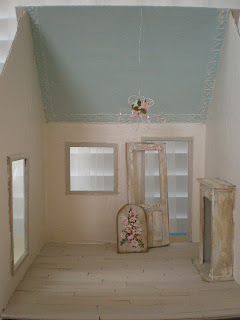 I also love the shabby-chic style. 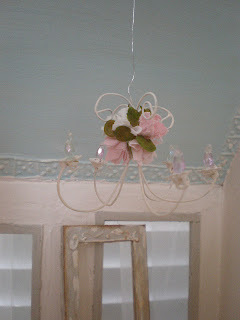 I LOVE the ceiling trim and the chandelier! Wow!